Provide comfort for the family of Mark DeMauro with a meaningful gesture of sympathy. It is with profound sadness that we announce the unexpected death of Mark R. DeMauro, of Wells, ME on Friday, April 5, 2019. Mark was born in New Britain, CT on August 11, 1970, son of Ronald M. and Susan (Johnson) DeMauro. He was 48 years old. Mark graduated from Kennebunk High School, where he was very active in sports, especially baseball, football and wrestling. Mark was a three-time State Champion in his weight class. After high school, he served in the United States Navy on the USS Theodore Roosevelt during the Gulf War. He then went on to graduate from the University of Southern Maine where he received a bachelor’s degree in Human Sciences. Mark was in the dental industry for over 15 years. Most recently he worked at Ormco Orthodontics Corporation. He loved sports, both as a participant and an enthusiastic spectator and coach. Mark always had a big smile, a helpful attitude and a great sense of humor, and collected friends wherever he went. He was a friend of Bill W. for over 24 years. Mark will be forever missed by his loving wife Erin L. (Maguire) DeMauro of Wells, ME; his beloved children, Sam, Nate and Mia; his mother, Susan DeMauro of Old Orchard Beach, ME; his father Ronald DeMauro and his wife Sue of Kensington, CT; sisters Carie Costello and her husband Dave of Falmouth, ME and Jody Mancini and her husband Michael of Kittery, ME ; his father and mother-in-law, John and Bonnie Maguire of Saint John, NB, Canada; brothers-in-law J. Craig Maguire and his wife Dorothy and Shaun Maguire, as well as many nieces and nephews. Friends may call from 1-3PM and 6-8PM on Wednesday, April 10, 2019 at Bibber Memorial Chapel, 111 Chapel Road, Wells. A Mass of Christian Burial will be held at 11AM on Thursday, April 11, 2019 at Holy Spirit Parish – St. Mary’s Church, 236 Eldredge Road, Wells. Interment will follow at Ocean View Cemetery in Wells. Should friends desire, donations in Mark’s memory can be made to the Wells/Ogunquit Youth Football, WOYFCA, PO Box 656, Wells, ME 04090 or online http://orgsites.sportsoffice.com/?org_id=65≤vel_id=0 at or the Wells/Ogunquit Little League, PO Box 974, Wells, ME 04090. 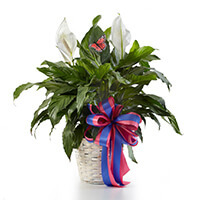 Jeff Kappler and Ormco Family purchased the Classic Peace Lily for the family of Mark DeMauro. Erin and Family..... my sincere condolences to you all during this extremely difficult time. My thoughts and prayers are with you. Erin and Family we were so saddened by your loss. Thinking of you guys ! !